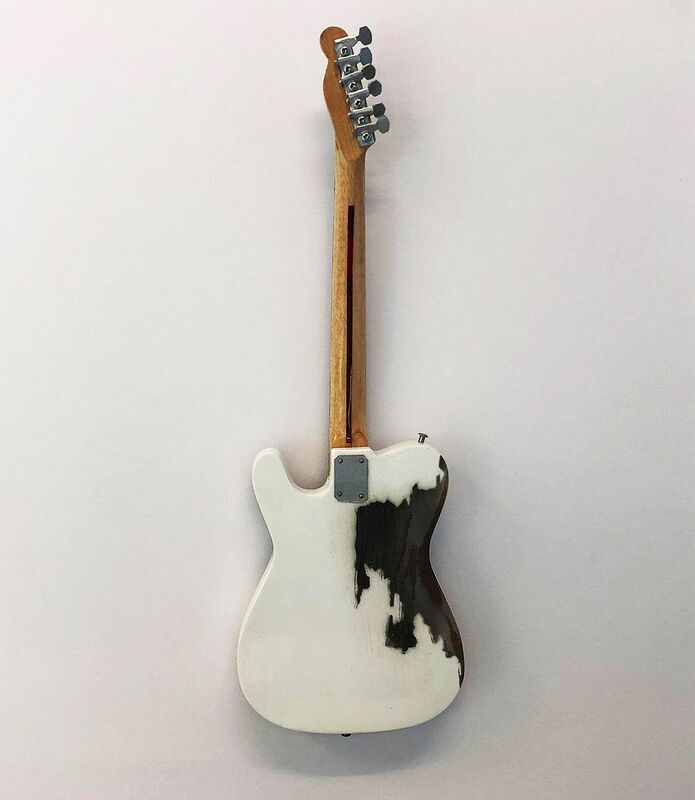 Rick Parfitt (Status Quo): 1960s Fender Telecaster White Miniature Guitar. There can't be too many guitars in the Rock world as extensively gigged as Rick Parfitt's 1962 Arctic White Fender Telecaster. 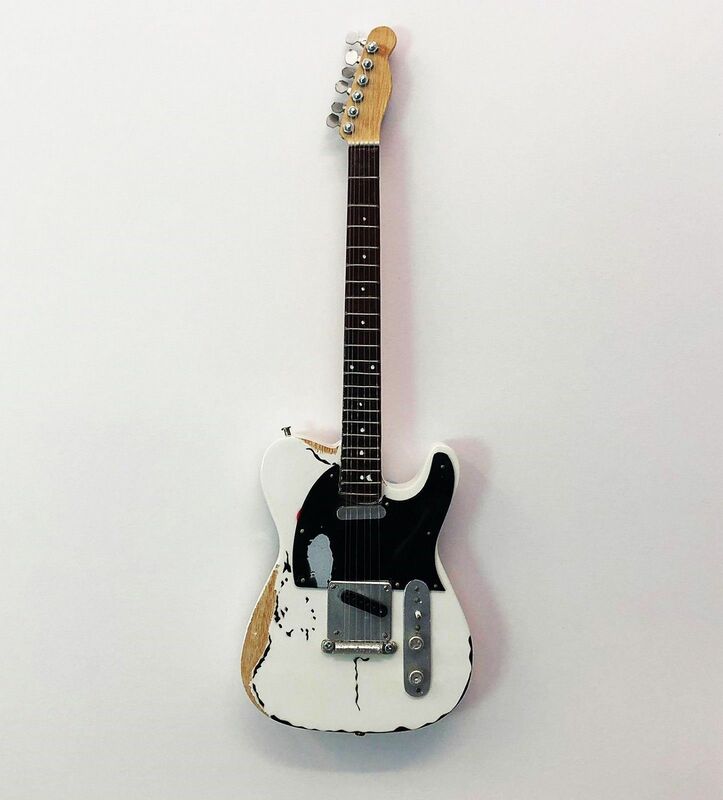 From 1969, when his band Status Quo ditched the flower power clothes and psychedelic sounds in favour of ripped jeans, long haired, no nonsense head down boogie, until Rick's untimely death in 2016, this guitar (originally purchased for £80) was his number one weapon of choice on stages and in studios all around the world. Eagle eyed guitar lovers will of course spot that the Rick Parfitt Telecaster has been subject to a fair few modifications since it found it's way into his hands and took centre stage with Status Quo nearly half a century ago. Due to Rick having an extremely hard hitting rhythm style the poor Telecaster was unable to withstand his brutal right hand assault. In the early days breakages were commonplace so in order to cut down on the frequent visits to the repair shop Rick's guitar technicians carried out a few upgrades. The original Fender ashtray bridge was cut in two and the vulnerable saddles removed. A Gibson stop-tail piece was fitted and the strings routed over the top of it thereby preventing string and saddle breaks. The tone control was disconnected as it was never used and a rubber tyre from a Lego set was put on the volume knob to make it easier to use in the heat of battle. Rick used a very heavy 14 - 56 gauge of strings which according to Rick's guitar tech 'are heavy enough to turn other guitar necks into a banana'. Love them or loathe them no one can deny the enormous contribution that Status Quo have had on the Rock world over the last 50 years. As well as being one of the most energetic and exciting live acts, they hold the record for the most Top Of The Pops appearances of any act in pop history. 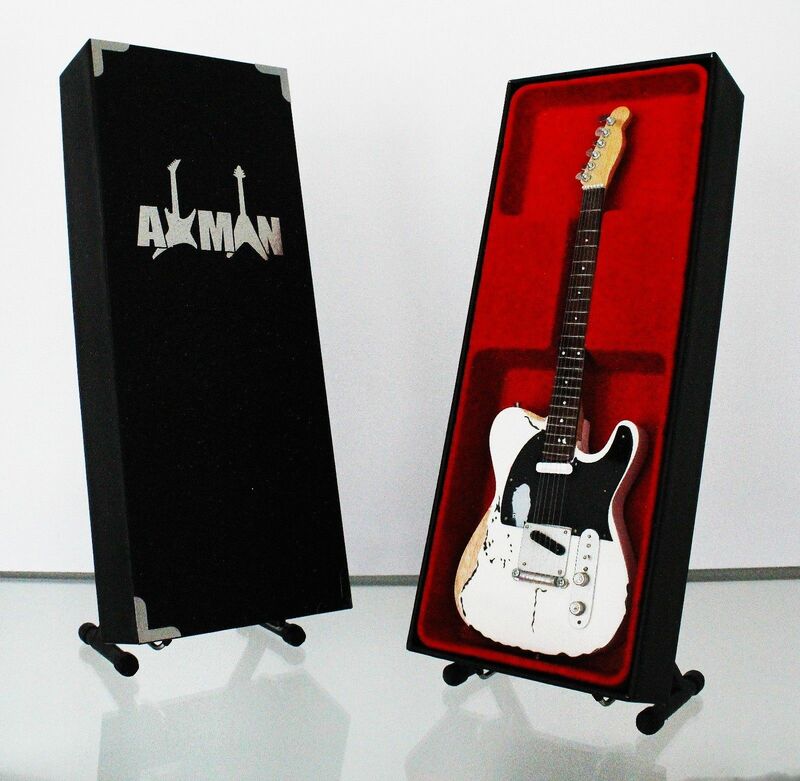 This unique Telecaster in the hands of Rick Parfitt has been in the spotlight for every step of that journey. All orders are sent within one working day from our UK warehouse using Royal Mail.